I’ve been smoking all sorts of things since I was 17, but the year before last I started using e-cigarettes and then totally stopped. It wasn’t quite that I decided, it was that I just didn’t feel I needed to smoke anymore. Smoking has always been part of my life – I remember being sent to the shops by my Dad to get cigarettes for him. But when he caught me smoking myself, I was in Uber-trouble. My sisters found out, everyone could smell it on my clothes…but I never admitted to it. Even now, after we’ve been out for the day, I sometimes think ‘ooh, time for a fag.’ But then I remember I don’t smoke anymore – wahey! It’s not a craving, but it’s a habit to think about it. I don’t think I had to work hard to give up. My friend Mary-Ann disagrees though – she says I showed a great deal of courage when quitting smoking. To make the decision, stick with it and never go back on my promise to myself. The truth is, God promised me life and Jesus gave up his life for me, so giving up smoking is nothing in the grand scale of things. But there are other things in my life that are difficult, and there are things that I am truly thankful for. It’s not always easy to navigate life. 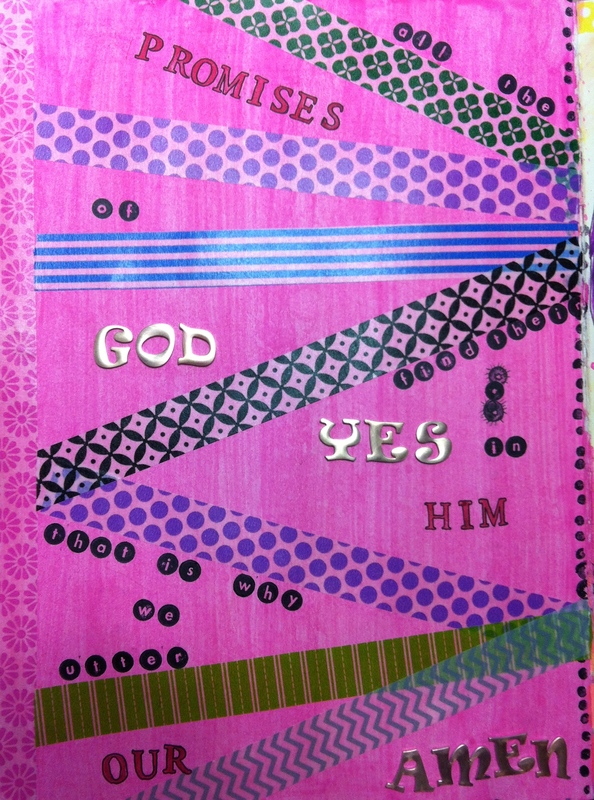 This journal page is about me hoping that I can say ‘yes’ to God. After I’ve told him I’m sorry for all the awful things I’ve done. Then I say ‘Amen’- thank you. 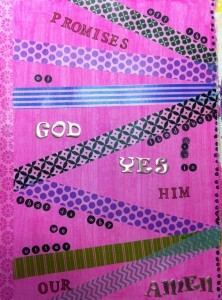 It feels to me like all of God’s promises find their yes in Him.